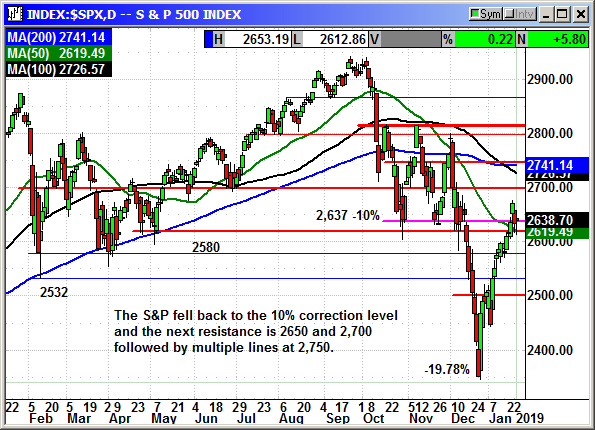 The Dow rallied to 294 at the open then fell to -97 before recovering. The worries remain the same with China, global economics and slowing growth leading the list. However, as we move through the Q4 earnings cycle the outlook for Q1 earnings has fallen significantly. At the beginning of October analysts expected 8% earnings growth and that has fallen to only 3%. That is stressing fund managers because a continued government shutdown and no resolution to the China trade issue could lead to an earnings recession. Stocks are in profit taking mode from four weeks of gains and as long as we do not start setting new lows the rally will eventually return. No specific news. 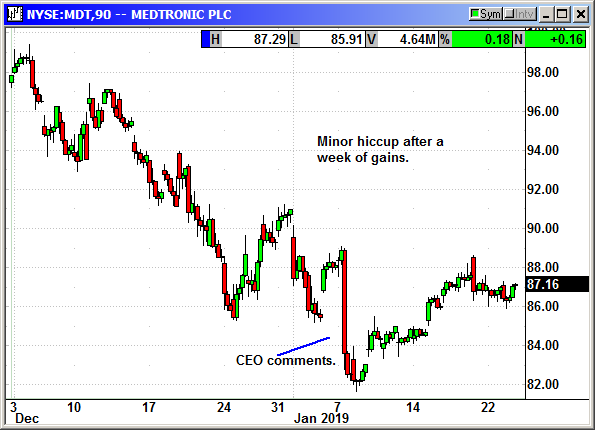 Shares gave back their gains when the Chinese trade story faded. No specific news. 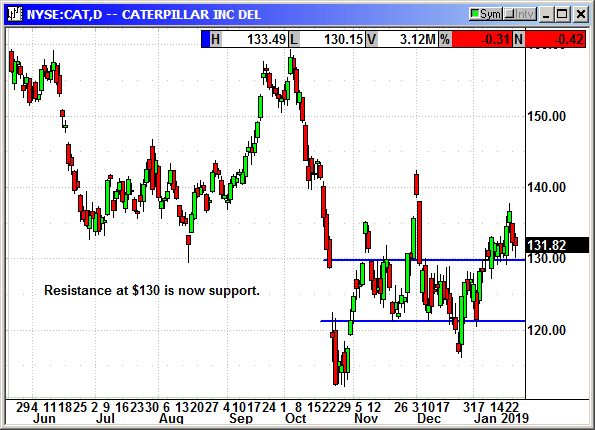 Shares holding over support. No specific news. 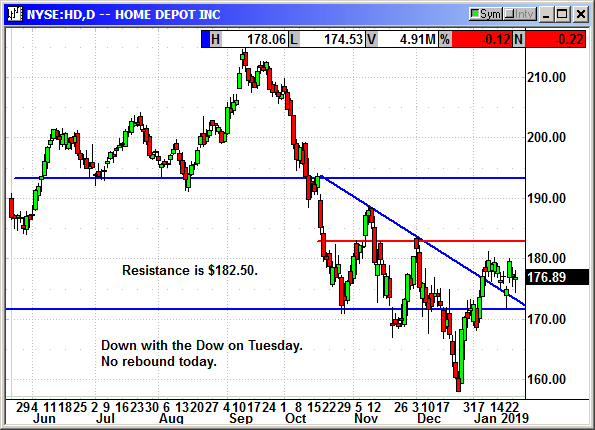 Shares weak on a downgrade to Lowe's and weak guidance from Stanley Black & Decker. 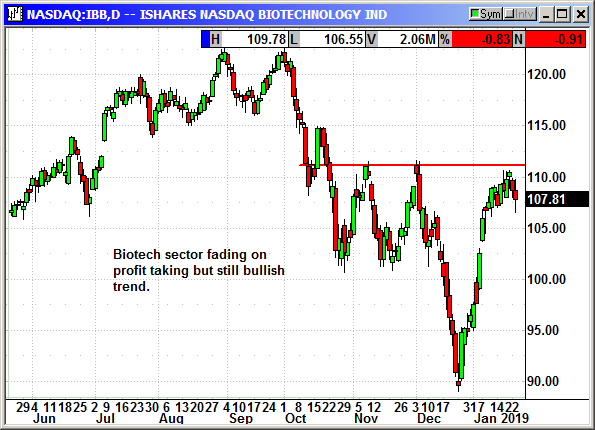 No specific news but the biotech sector is taking some profits this week. 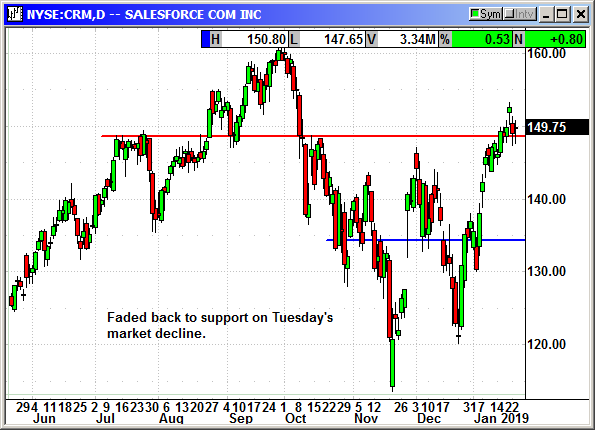 It did close well off the lows today. No specific news. No decline. That is actually a positive when the sector was weak. 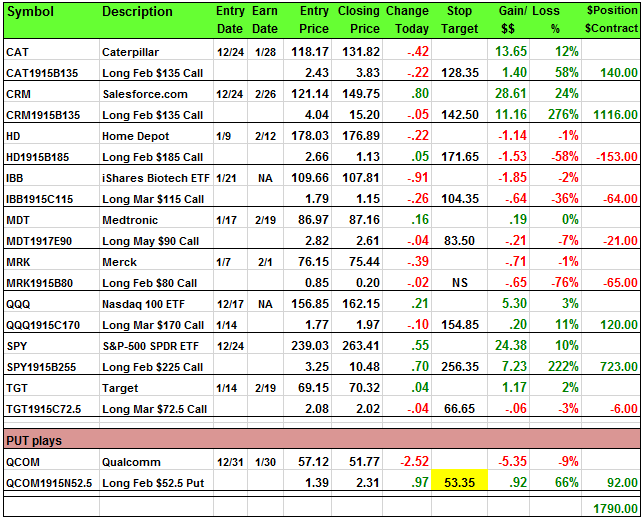 Long May $90 call @ $2.82, see portfolio graphic for stop loss. 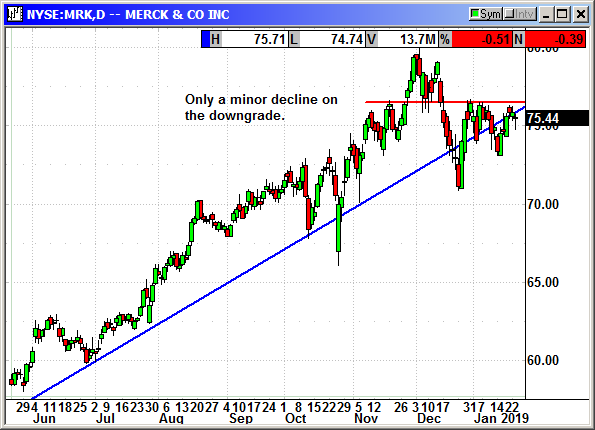 BMO Capital Markets downgraded Merck from outperform to market perform citing overdependence on Keytruda. 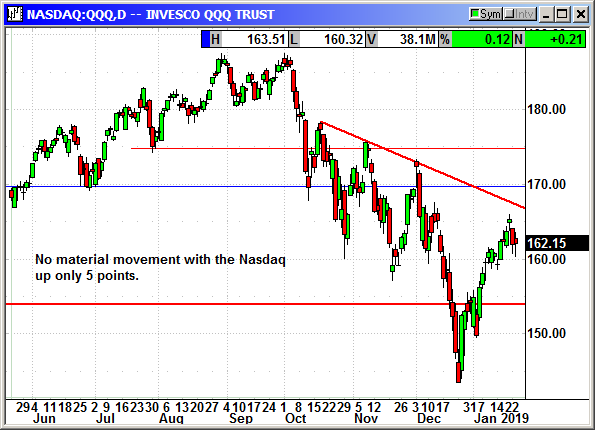 The QQQ only moved fractionally because the Nasdaq only gained 5 points. 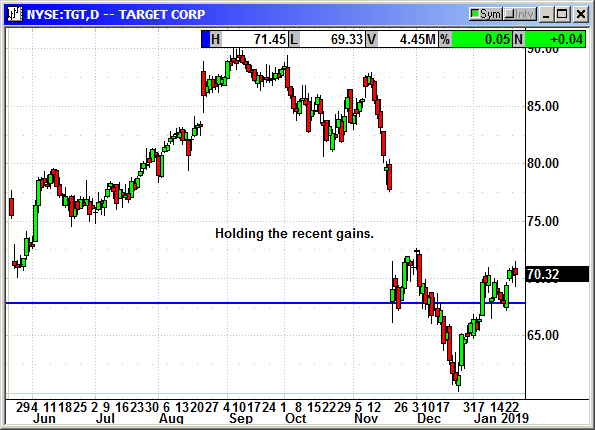 No material movement with only a 5-point gain on the S&P. 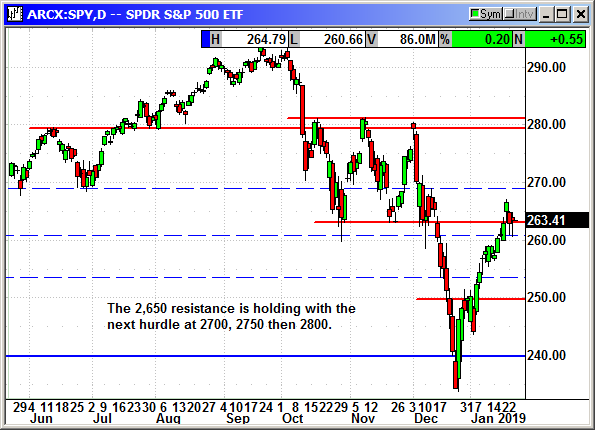 Resistance at 2,650 is back in play. Not a material move. The company said they will soon be able to accept Apple Pay, Google Pay and Samsung Pay. 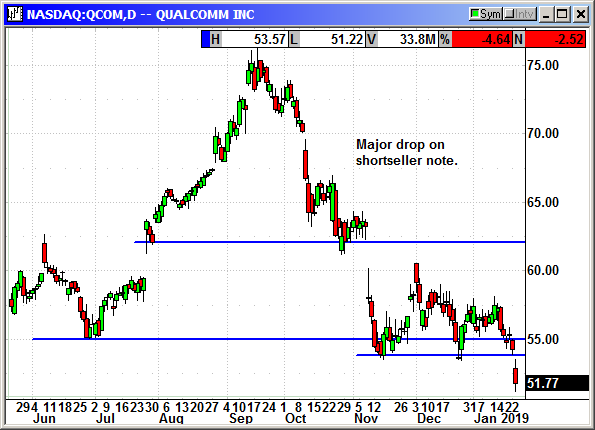 Noted short seller Sahm Adrangi and his Kerrisdale Capital hedge fund took aim at Qualcomm saying a loss to the FTC in the current trial would cut the stock price in half. If the company loses they would be forced to "license core patents to competitors and to renegotiate all of its existing licenses on fair terms." Kerrisdale argued that Judge Lucy Koh, currently presiding over the case, has already ruled against the company on several maters and may be inclined to rule in favor of the FTC.